Let me break this down for you: Chocolate shell. Chocolate cake + peanut butter layer. Caramel sauce layer. Chocolate chip cookie dough layer. Chocolate lid. Sprinkles. AKA everything that is good about baking. Happiness in a cup. Bliss made tangible. Need I go on? Just make these. It might take you a few hours, but it’s worth it. I mean, LOOK AT IT. Did you read what’s inside?! Pure joy. 1. Microwave 2 cups of chocolate chips plus 1 tablespoon shortening for a minute. 2. Stir until all the chips have melted and it’s smooth, microwaving at 15-second intervals as necessary (stir first; usually simply stirring will work out the un-melted chips). 3. Drop a spoonful or two of chocolate into each cup, using your finger to push it up the sides of the cupcake liners. You might have to do this a few times to get a good coating on the sides and bottom. 4. Let these harden in the fridge or on the counter; I used foil liners so once the chocolate hardened, I could take the liners out of the muffin tin (the foil will hold the shell’s shape, and you can place these chocolate-filled foil-liners on any baking tray or plate) and make another round to get 24 cups. 1. Use an electric mixer to combine the butter, brown sugar, and granulated sugar until fluffy (1-3 minutes). 2. Mix in the milk and vanilla extract until combined. Add the flour and powdered sugar until well-mixed. 1. Prepare the chocolate cake mix according to instructions, bake, and let cool completely (the refrigerator can help with this). 2. Cut off all edges (and eat, obviously). Crumble the cake into a bowl. 3. Microwave the peanut butter for 30 seconds; stir until it’s smooth and almost liquid-y. 4. Mix the peanut butter into the cake crumbles. You might need to use your hands to mix it in really well and get the cake sticking together. 1. 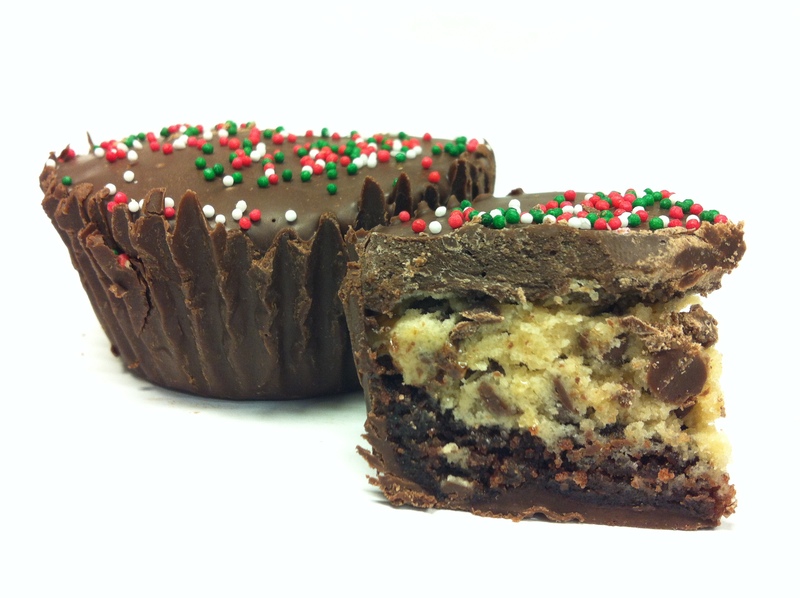 Push about a ping-pong ball-sized scoop of chocolate & peanut butter cake into each cup, spreading it out to the edges. 2. Pour in a thin layer of caramel sauce. 3. Top with another ping-pong ball-sized scoop, this time of the cookie dough, and press down until smooth. 4. When all the cups are filled, melt another 2 cups of chocolate chips plus 1 tablespoon shortening. Top off each cup (about 1 tablespoon) with the chocolate and spread a spoon or tilt/shake the cup gently to get the chocolate to spread out. 5. Decorate with sprinkles before the chocolate hardens. If the chocolate hardens before you get the sprinkles on, a quick blast with a hair dryer on the highest heat setting will melt the top layer of chocolate so you can add sprinkles. Cool on the counter or in the fridge. Posted by missboulanger in Uncategorized, You can't categorize me!